Time to get geared up for the new wedding clients! Today, I spent part of my morning thinking about the new client. The client that needs a wedding photographer. The kind of photographer that wouldn't interrupt their day, take plenty of pictures to view, and capture the essence of the moment. 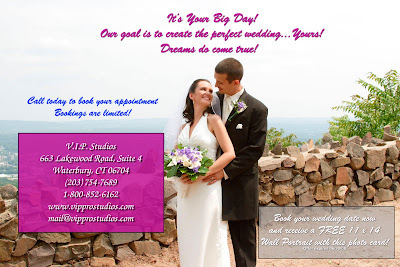 A photographer like VIP Studios! Looking forward to meeting the new faces with great expectation. I love photographing and being part of their one day of great importance and honored to be chosen to take part in that celebration of life, celebration of love, celebration of two becoming one. This year will be a good year! Congratulations to the bride and groom, their families, and their tears of joy. Thank you for the opportunity to share in this precious moment.......to share in your precious memories. Looks Like I Started A Fire!!! Looks like I started a fire for you and Model Mayhem! VIP Studios had the pleasure of photographing Gaudi back in February and she was absolutely beautiful to work with. Gaudi contacted me recently and asked if I knew of any places she could show her modeling talents to. I recommended Model Mayhem to her and she went to the web site and signed up, added 20 of the pictures VIP Studios photographed of her and all hell broke loose! She is in high demand now and has been contacted by many, many photographers that saw her pictures. I am so glad I met you Gaudi! And I LOVE your pictures! You are AWESOME!